To take part in KidsedchatNZ you need to first create a class twitter account. This is free and can be done by clicking here! You will need one twitter account per class. It's always good to come up with a cool name for your class twitter account and it's very important to fill out your profile. Once you have done this you need to get your twitter name added to the KidsedchatNZ twitter list. You need to get your name on the KidsedchatNZ Twitter list as it allows all the classes taking part to see your tweets. To do this you need to send a tweet to @Kidsedchatnz and we will add you straight away. Once you are on the KidsedchatNZ Twitter list you need to subscribe and follow the list during the session. You can subscribe to the list by clicking here. Here's a video that will help you do this. An easy way to follow the KidsedchatNZ Twitter list tweets is to use Tweetdeck. Here is a video that explains how to use it. It's a good idea to create classroom experts that can help other students with their tweeting. You don't have to have your whole class take part in KidsedchatNZ. A small group works well. Always check the KidsedchatNZ Blog prior to the session to get familiar with the week's questions. It's always a good idea to go over the questions prior and brainstorm ideas. We take Digital Citizenship / Cyber Safety seriously. Please talk with you class about this before taking part. Finally, here is an article in VLN Primary School all about KidsedchatNZ. KidsedchatNZ questions are currently being posted every week by the organisers Marnel van der Spuy, John Willoughby and Juliet Revell. 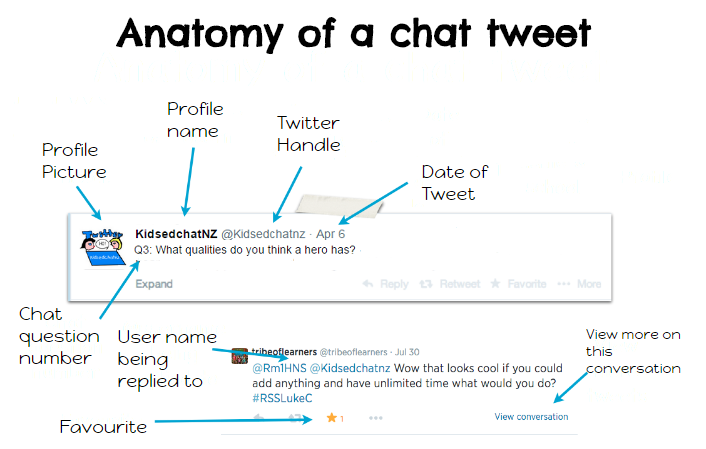 We hope all this makes sense and we look forward to seeing your class at the next KidsedchatNZ session!